Photo courtesy of WSU The Raiders lost to Murray State 73-54 on the road. 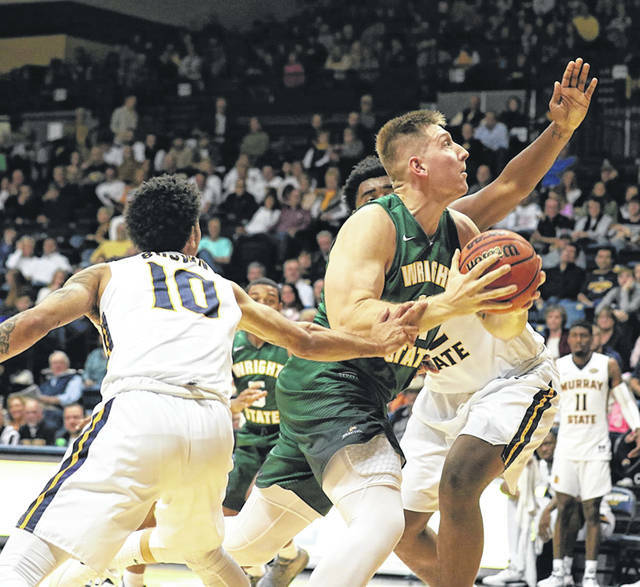 MURRAY, Ky. — The Wright State men’s basketball team went on the road for the first time this season and lost, 73-54, to Murray State Nov. 10. Senior Mark Hughes led the way with 16 points and five rebounds while Loudon Love chipped in 15 points and seven boards. Cole Gentry helped with 11 points. Chris Wampler added seven points. WSU shot 38 percent with only three three pointers while the Racers shot 54 percent, making 10 threes. The Raiders committed only 12 turnovers as they forced 21. Murray State outrebounded the Raiders 41-25. The Raiders bounced to a 7-0 lead on four points from Love and three from Hughes in the first half. MSU came back to take a 15-9 lead but WSU knotted the score at 17 on a Gentry layup. Both teams exchanged baskets, but the Racers led at halftime 35-29. Hughes was 5-6 from the field and ended the first 20 with 12 points as Love had eight points and five rebounds in 11 minutes. The next 20 minutes started with MSU keeping on the pressure as it took a 45-34 lead at the first media timeout. WSU cut the lead 45-41, but the Racers increased to 52-42 by 11:13. That lead continued to grow, but the Raiders tried to keep it close. MSU led 68-52 with 3:23 left. WSU is now 1-1 while the Racers are 1-0. For more information on Wright State athletics visit www.wsuraiders.com. https://www.xeniagazette.com/wp-content/uploads/sites/32/2018/11/web1_wsumen.jpgPhoto courtesy of WSU The Raiders lost to Murray State 73-54 on the road.